Includes Visit to 2KW Miniature Solar Power Plant at Golden Swan. Effective functioning of solar power plants. Includes Breakfast, Lunch and Hi Tea. 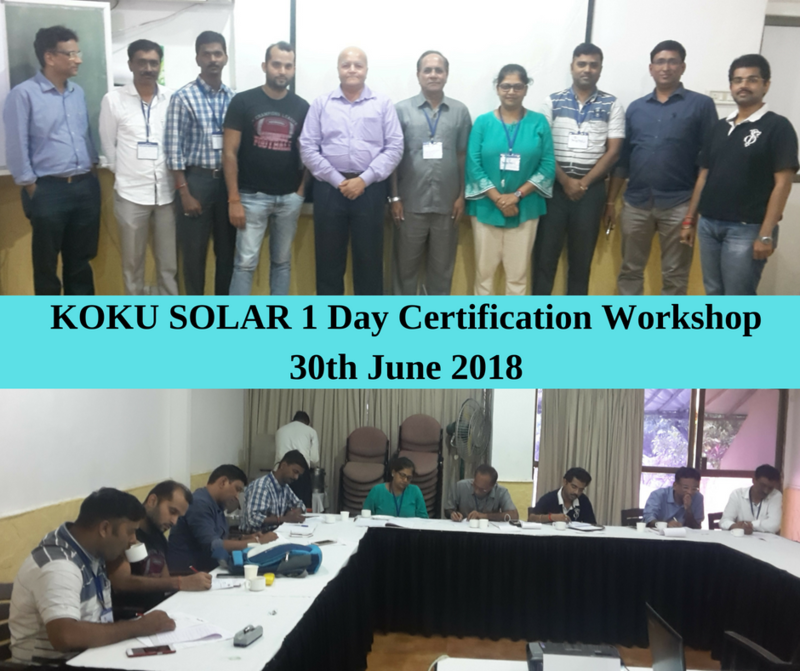 Opportunity to join KokuSolar Training Programs, Channel Partner. REGISTER NOW by paying Rs.3540/- (incl 18% GST) and avail early bird discount. Call or whatsapp 8080773344 or 9820037904 for more information. 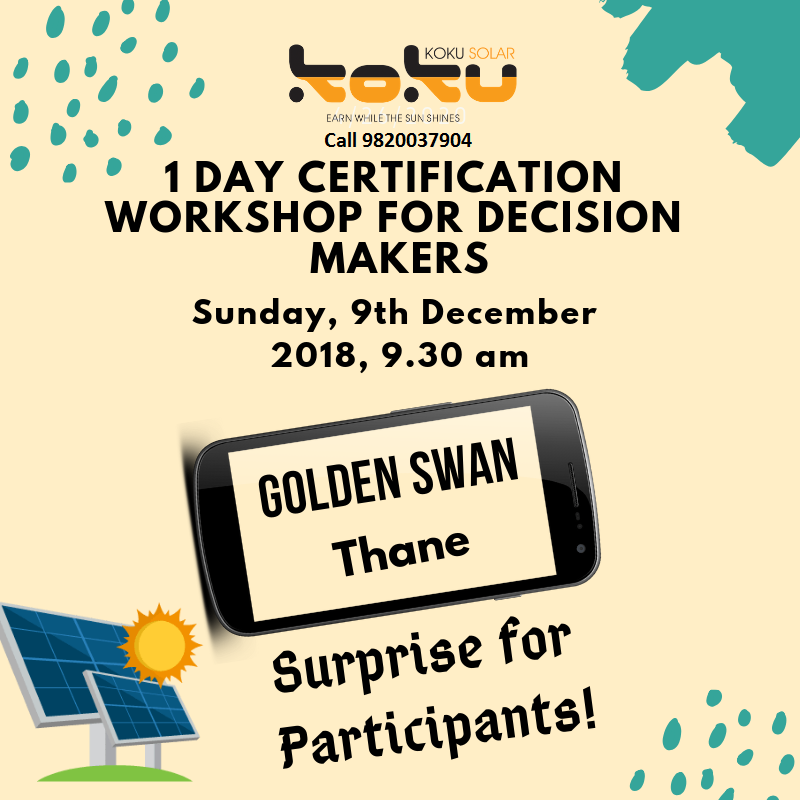 One Day Certification Workshop will take you through a guiding tour of the solar power plant will special emphasis on investment, return on investment, savings, recurring expenses, valuation, risks and rewards, taxation, saving on carbon emission, making plan and installing solar power plant. 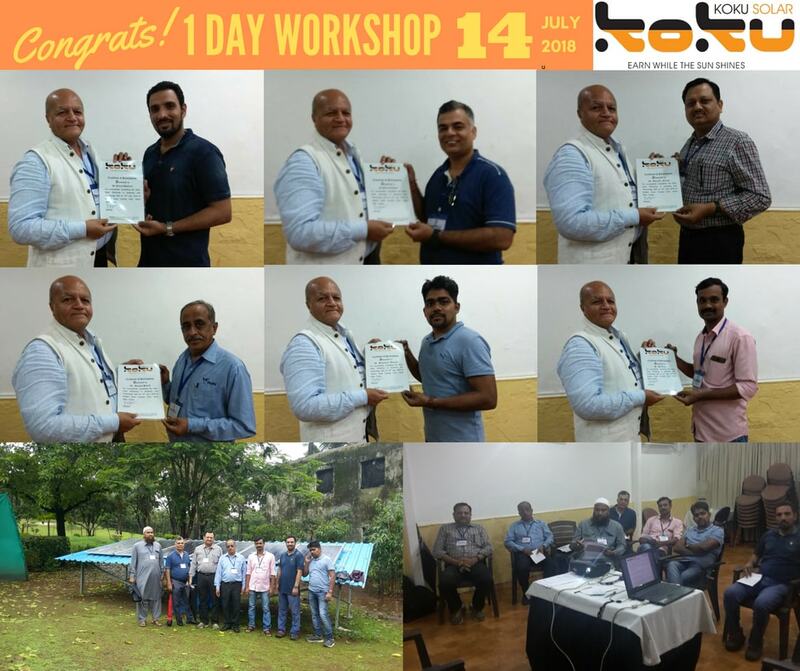 One Day Certification Workshop is specifically designed for non-technical aspirants. This program is for the decision makers. If you are running your own business or you are part of finance or in the top management, you need to be sure about the financial consequences of every decision. 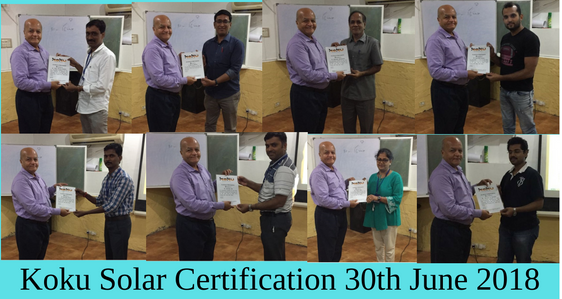 One Day Certification Workshop will guide you through all the financial aspects of installation of solar power plants. This will empower you to take a right decision! You will get a complete overview about installation of solar power plant and make you confident about the viability of solar energy. You will be able to take responsibility about the project and will make you an expert in addressing all the queries and doubts of your team members who will finally support you in installing solar power in your premises. 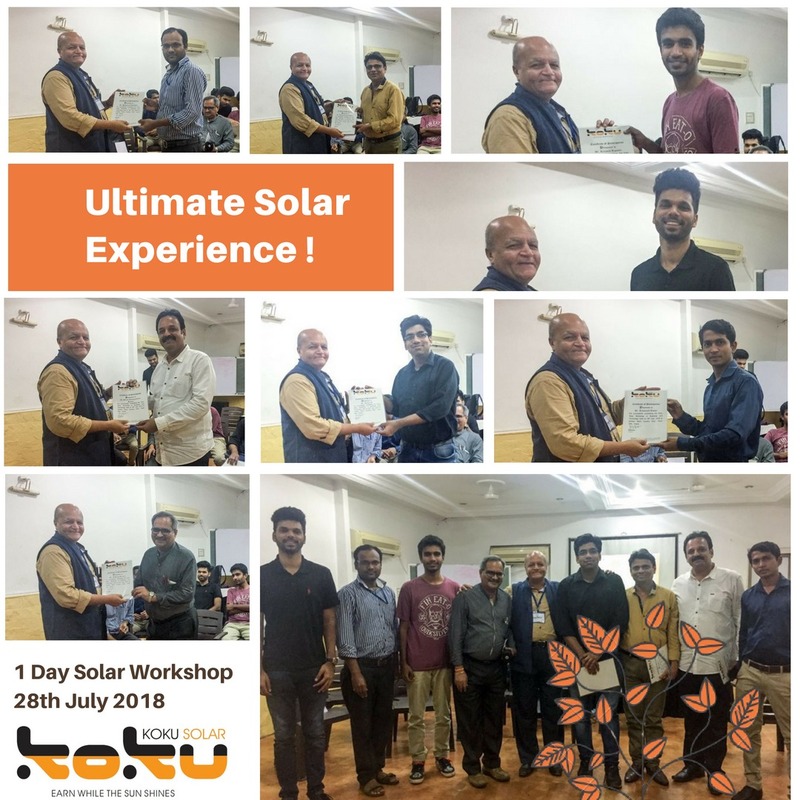 One Day Certification Workshop guarantees you to get complete information about installation of solar power plant and how will it benefit your organization whether it is a housing society, corporate building, warehouse, hotel, hospital, educational institution and so on. You will become a wise decision maker. 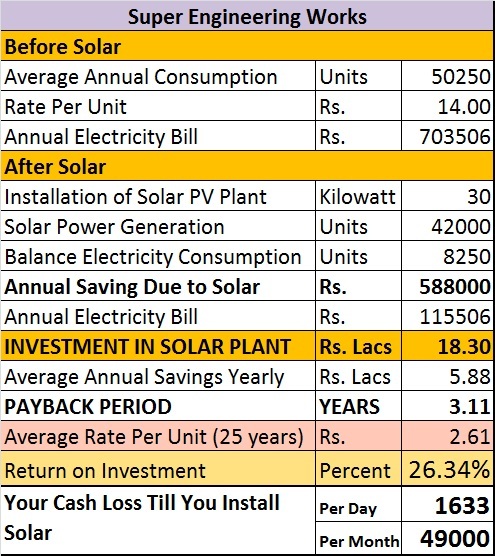 You will be choosing to install a solar power plant with optimum investment and maximum returns. You will be able to take your team along with you and will be able to ensure the success of your solar power plant.